As best-selling author and entrepreneur Seth Godin puts it, ‘content marketing is all the marketing that’s left.’ However, given that over 2.5 quintillion bytes of content are produced every single day, sticking out through high-quality content that’s actually seen and considered valuable by target groups – and actually helps to achieve business and communication objectives – is not an easy task. Paid promotion is of no help here either. Experts argue that digital advertising – such as brand and direct response ads – have lost 97% of their effectiveness along the value chain, with, for example, ad blockers, ad fraud and GDPR likely to kill the remaining 3%. Also, the fact that Google and Facebook take the biggest share of the digital ad spend globally translates into a duopoly dictating terms and conditions in this space – with dire consequences for companies advertising. Google and Facebook can, for example, inflate prices at will and advertisers have no choice but to go along with them. The new reality is that companies are forced to advertise, often without adding value to their business (see paragraph above), which effectively turns companies’ ad spend into a new type of business tax since for most of them stopping advertising is not an option. The more content is published on your website, the more traffic the website gets and it will also rank higher in SEO terms. Also, by publishing regularly, brands gain authority and visibility within their industry whilst providing value to their target audience. But, that’s difficult to do, particularly in terms of identifying those topics that are relevant, informative and stimulate interest in your products and services. A Content Intelligence system can help here by scanning the entire web filtered by topic-relevant keywords, industry players and influencers. That way, you are continuously provided with real-time inspiration that enables you to create a high volume of diverse, relevant content. Blogger and marketing strategist Mark Schaefer calls it the decade of the content shock: web content is doubling every 9 to 24 months with Internet users’ ability to consume it being flat. In this busy media landscape where users’ engagement is decreasing, how do content marketers successfully target and convey their message? 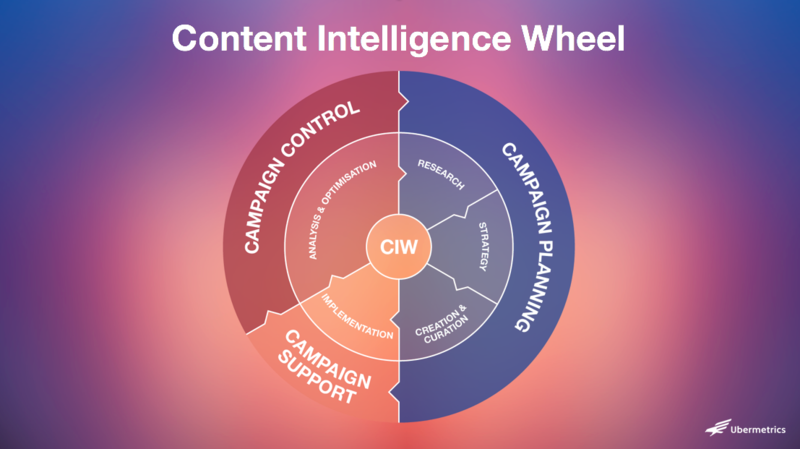 What they need is a systematic approach: with Content Intelligence, communicators can identify which content is published within their topical sphere and understand which topics have the potential to engage specific publics. According to the Content Marketing Institute, only 24% of B2B marketers consider their content marketing strategies “very successful” or “extremely successful”. Traditional digital analytics provide only an incomplete view of content performance, making it difficult for content marketers to truly evaluate their content strategy. Content Intelligence offers thorough insights – based on advanced analytics such as sentiment and virality analyses – which reveal how a piece of content performed. This enables content marketers to optimise their content accordingly. Statistics show that 70% of marketers lack a consistent and integrated content strategy which prevents them from measuring performance against objectives. Successful content marketing strategies are data-driven and Content Intelligence delivers actionable insights that allow communicators to create a perfectly tailored content strategy for their business needs. They can analyse their entire industry in order to understand which content and channels are most effective. This allows them to position themselves as well as adjust and plan their Content Marketing efforts. Content creation is very time consuming: creating a blog post can take from 6 hours to four weeks, while social media posts can take up to 4 hours. This often forces content marketers to lose consistency and publish content less often. However, businesses publishing 16 or more posts a month get almost 3.5x times more traffic than businesses publishing zero to four articles a month. Content Intelligence reduces the overall time needed to produce original content by eliminating the time spent guessing when, by which means and what content to publish for whom. You can also stay on top of all the content available within your industry which effectively supports you to curate and share relevant, third-party content. Measurement is challenging for communicators, especially when it comes to content: due to the lack of reliable metrics, 47% of B2B marketers don’t measure content marketing ROI. With Content Intelligence, however, you can measure and analyse the performance of your content by extracting quantifiable, data-based results to establish the ROI of your content. Want to learn how Ubermetrics can take your content marketing to the next level? Then talk to us today.